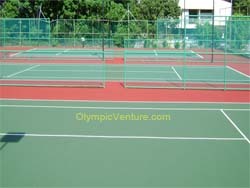 Installed 3 tennis courts and 1 futsal court for Labuan Club in Sabah using Plexipave Coating System (April 2010). 3 Plexipave coating tennis court for Labuan Club. 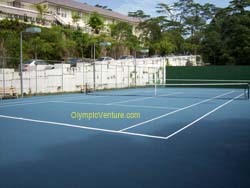 Convert 1 number synthetic turf to rubberized cushion tennis court for Bukit Jambul Country Club, Penang (May 2010). 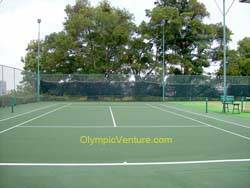 1 rubberized cushion tennis court for Bukit Jambul Country Club. Another view of rubberized cushion tennis court. Re-surfaced 2 hard tennis courts for Open University Malaysia, Kuala Lumpur (May 2010). 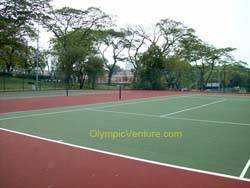 2 tennis hard courts for Open University Malaysia. 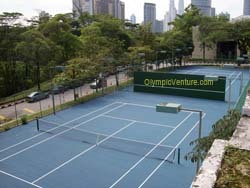 Another view of 2 tennis hard courts for OUM, KL. Installed 2 Olymflex Rubberized futsal courts in University Kebangsaan Malaysia, Kuala Lumpur (June 2010). Re-surfaced 2 tennis hard courts using Fiber-Reinforced base and Plexipave coating system for Saujana Golf and Country Club, Kuala Lumpur (June 2010). 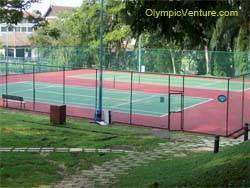 2 tennis hard courts for Saujana Golf and country Club. 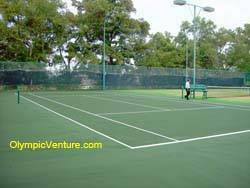 Another view of 2 tennis hard courts using Plexipave coating system.